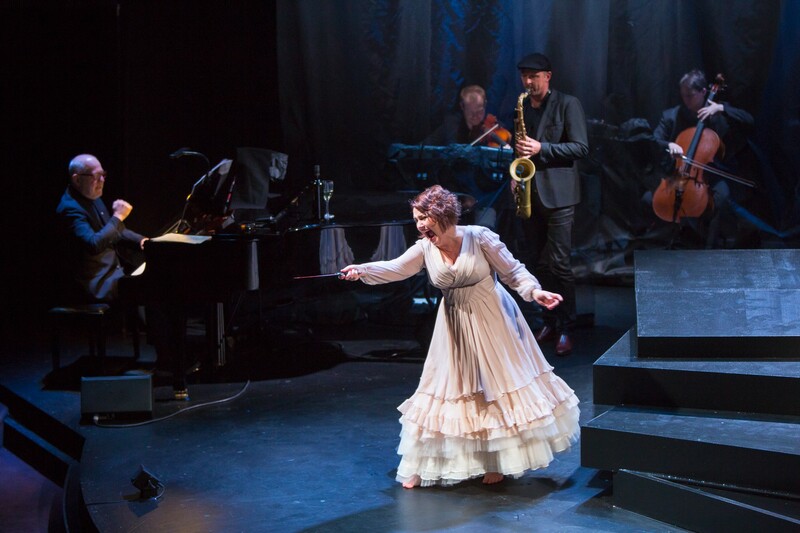 Operatic nightingale Emma Matthews gives a tour de force performance as she returns to the Melbourne stage in The Space Between, a unique and highly personal new work by Paul Grabowsky and Steve Vizard. Before the evening diverges into existential territory, Matthews takes to the stage in the manner most familiar to those who have followed her multi-award winning career. Silhouetted centre stage, Matthews sings climactic cadenzas from Lucia di Lammermoor’s famous “Mad Scene,” glass harmonica sound effect and all. Dressed in flesh-toned ruffles with a sequined splash of blood, Matthews reaches Lucia’s high note and then breaks away, the note reverberating on as an electronic effect. The title of this new and original work refers to the music in the space between notes and the wild ride of imagination, memory and fear that we all can experience at life’s climatic moments. A free flowing, non-linear song cycle, The Space Betweenis performed in a single uninterrupted 70-minute act. Applause, when it finally comes at the end, is abundant, with an enthusiastic standing ovation given on opening night. Vizard’s new material takes some careful listening to be absorbed; alternatively, the audience could simply lose themselves in the dreamscape imagery of the lyrics. 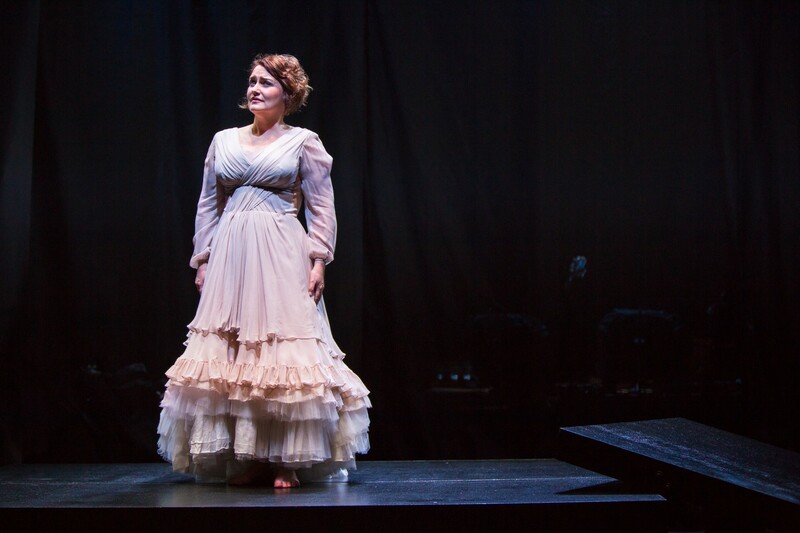 Matthews is not necessarily playing herself, but rather a kind of everywoman opera singer, railing at the depiction of women in opera as fragile heroines and tragic, powerless victims. The central character sings of frogs and of fathers as she buffets from memory to memory. Composer Grabowsky accompanies the work on grand piano, subtly conducting fellow musicians: Matthias Schack-Arnott on percussion, Roy Theaker on violin and Paul Zabro on cello. Featured musician Jamie Oehlers adds texture and presence as he frequently traverses the stage playing saxophone. Grabowsky’s music is not intended to be particularly melodic, but its groovy late-night vibe is certainly seductive. Most importantly, Grabowsky has had the judicious insight to craft the music to solely serve as accompaniment for the celebrated beauty of Matthews’ soprano voice. As well as being a stunning singer, Matthews is also an experienced and talented actress. Director Leticia Caceres has worked collaboratively with Matthews, and, presumably, Vizard, to shape the piece into a distinct series of episodes. Caceres has Matthews make full use of the amphitheatre-like auditorium of the Fairfax Studio, otherwise keeping stage business minimal so as to allow full focus on the text. Designers Rebecca Hayes and Esther Hayes place a triangular pond, of sorts, at the bottom of a staggered set of black square platforms. A translucent rear curtain allows glimpses of the musicians and provides a canvas for lighting designer Nick Schlieper to cast ghostly shadows. 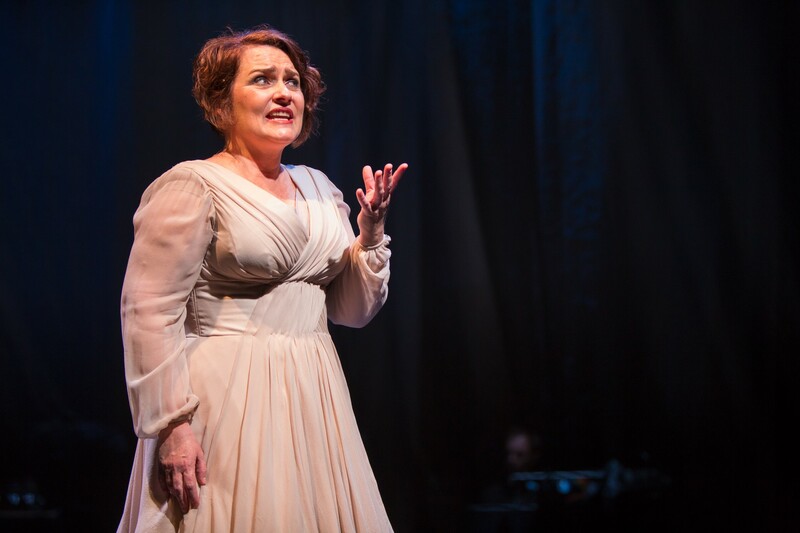 From the spine-tingling opening notes onwards, Matthews is in stellar form, the superb quality of her singing and acting serving as a painful reminder of her absence from the operatic mainstage. With the gentle accompaniment of the band, Matthews’ rich luscious voice creates its own special music. Performing the personal, emotionally charged lyrics, Matthews brings the inner world to life with compelling clarity. In full flight, Matthews’ performance is mesmerising. The commission, creation and production of The Space Between is a welcome sign of the healthy support for Melbourne’s artistic scene. Emma Matthews: The Space Between plays at Fairfax Studio, Arts Centre Melbourne until 23 September 2018. Photos: Mark Gambino / courtesy Arts Centre Melbourne.